The Tibetan Spaniels were developed in the Himalayan Mountains of Tibet more than 2000 years ago. This breed was considered to be a breed of God, owned by the Buddhist and was not for sale. This breed of dog was only gifted by the Buddhist to Royal families and other important personalities as a symbol of peace. The breed, also referred to as a Tibbie, is a very lively, energetic and fearless breed. They make good watchdogs and guard dogs. They have really nice and pleasant nature which make them true champion. The Tibetan Spaniel is very intelligent and sensitive breed which show lot of attachment with their master and can become destructive if they are left alone for long periods. They are very loyal to their family and are prone to barking if they see any stranger in sight. This breed of dog requires early socialization and obedience training for them to be well behaved housedogs. They do well with other small pets and animals. 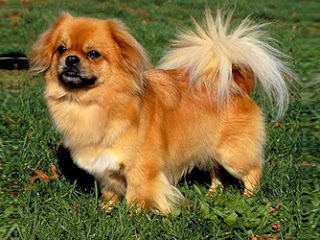 This breed of dog has double coat with the outer coat being medium and silky where as the under coat is dense and soft. The coat comes in a wide variety of colors such as cream, fawn, white, red, gold, black, and black and tan. This breed is an average shedder and shed their undercoat twice a year. This breed of dogs requires regular and consistent training. The training should be given with fairly, firmly, devotedly and patiently as they will not respond to any harsh methods of training. This breed of dog likes to go for a walk and love to participate in games and enjoys family play sessions. They require weekly brushing in order to avoid dead hair and dirt. Moreover, bathing should only be given when mandatory and must be done with mild shampoo. They will survive in apartments if given sufficient exercise. However, they are best suited to an area with ample running space available.